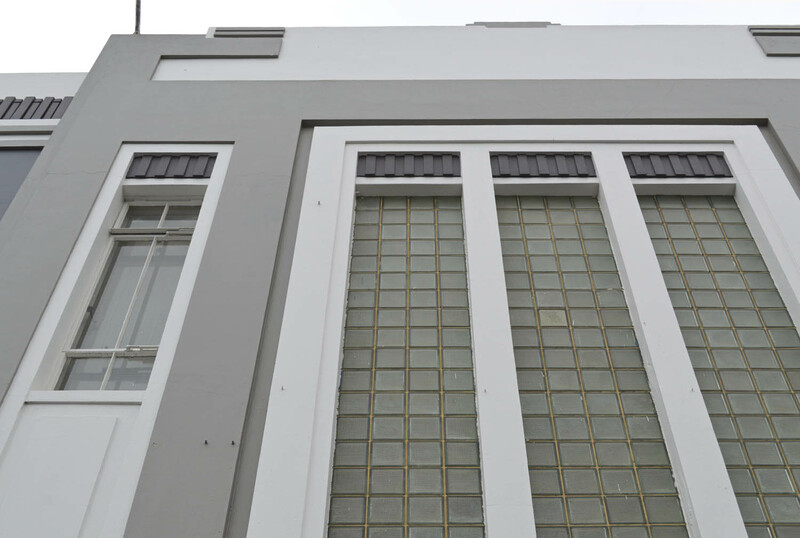 The Dunedin building industry enjoyed a brief period of reinvigoration between the Great Depression and the Second World War. Many big businesses were keen to project an image of vitality and modernity, and the clean lines of the Milburn Lime and Cement Company’s new head office in Crawford Street certainly did that, while in its fabric the building was a showpiece for the company’s chief product. 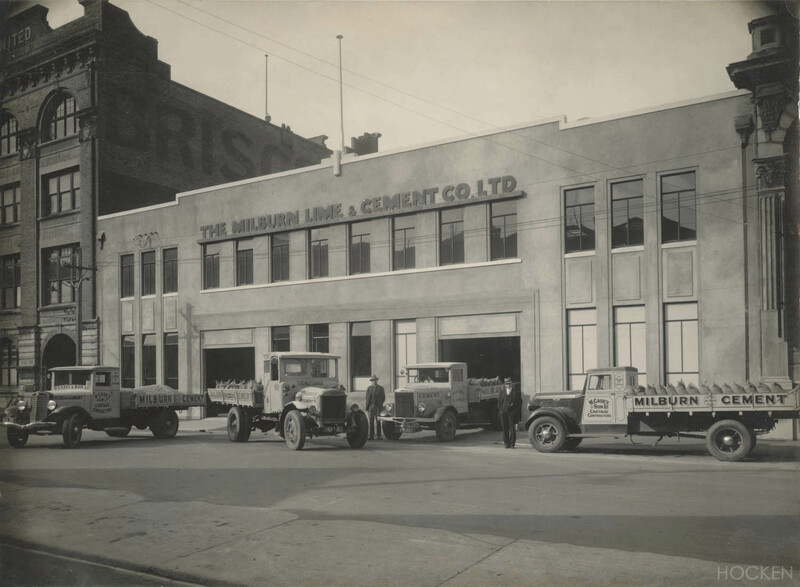 Concrete construction revolutionised building methods in the late nineteenth and early twentieth centuries, and the Milburn company was largely built on its rapid development. The firm was founded in 1888, when a syndicate of businessmen acquired the assets of James McDonald, including established lime works at Milburn and a small cement works at Walton Park. 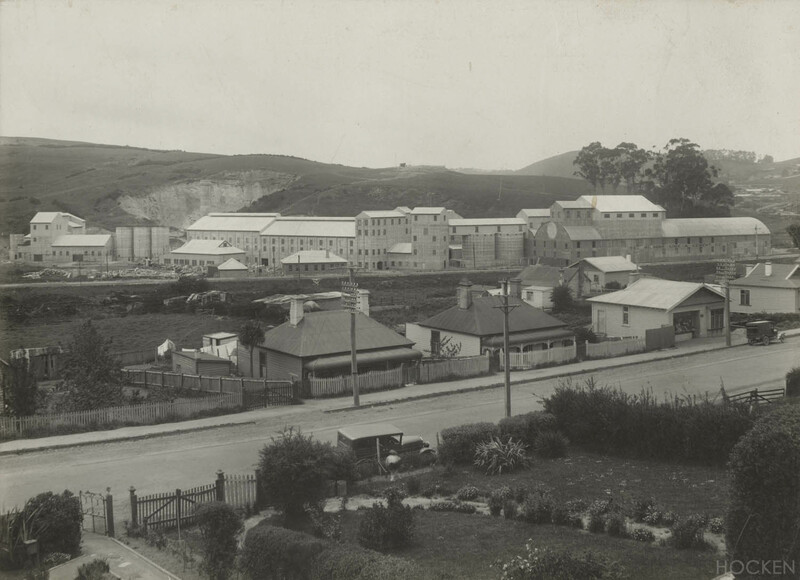 The new company’s principal cement works were at Pelichet Bay, from 1890 to 1929, and then at Burnside from 1929 to 1988. 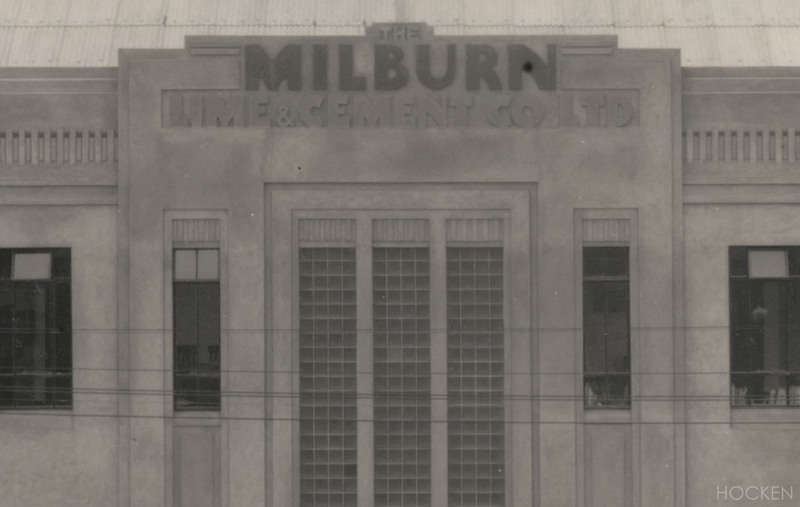 Milburn took over many smaller businesses and became one of Otago’s largest companies. In 1937, it commissioned the architects Salmond & Salmond to design a two-storey office head office building in Crawford Street. Crawford Street lies on land reclaimed in the 1860s and 1870s, and extrapolates the original street plan of Charles Kettle. As with Filleul Street, there is a story that it was named after someone who happened to be in the surveyor’s office on the day a name was needed, although at best that’s probably a simplistic tale. In this case the man was George Crawford, an early settler who arrived on the Philip Laing in 1848. From 1869 the site of the Milburn building was owned by Briscoe & Co., which established a yard there. In 1905 an open shed was erected on part of the site, and the following year a brick store building designed by James Louis Salmond was built. An adjoining, almost identical, store was constructed in 1907. This work coincided with the erection of a four-storey warehouse, designed by Walden & Barton, on the site immediately to the north. Briscoe’s kept stores on the western side of Bond Street until 1956, and retained the large warehouse until 1972, but sold the ones on the site we’re looking at to Milburn in 1935. The buildings there were all removed, including their foundations, but the specification for the new building allowed for the reuse of roof timbers and ironwork, as well as bricks (for internal partitions). 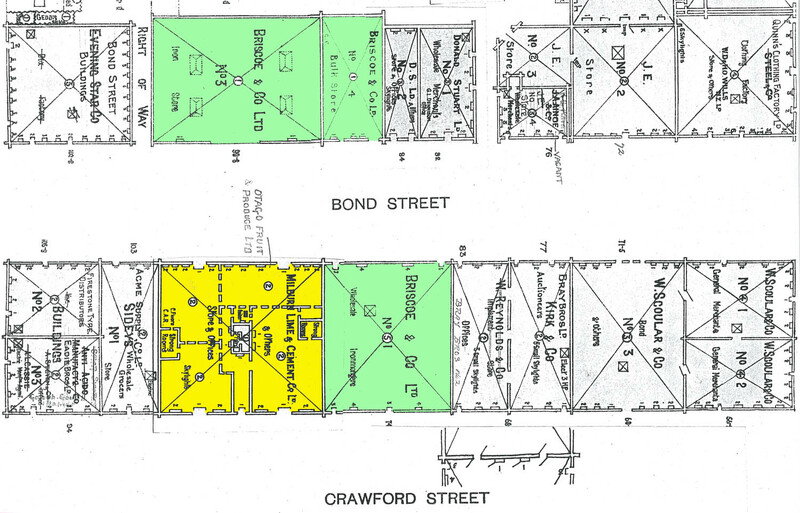 Council of Fire & Accident Underwriters’ Associations block plan, amended and updated to about 1940 (from the 1927 edition), showing the Milburn (formerly Briscoe) site in yellow, and the other Briscoe sites in green. The partner in Salmond & Salmond responsible for the design was Arthur Louis Salmond (1906-1994), son of practice founder James Louis Salmond. 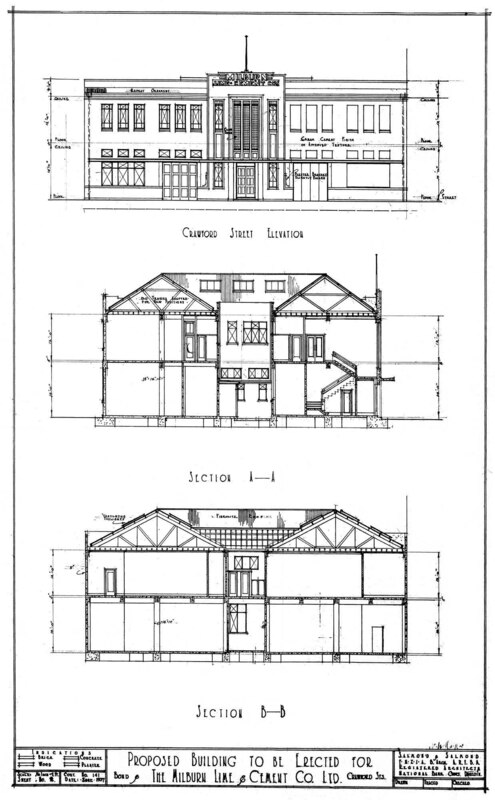 He had been in the first intake of full-time students at the Auckland University School of Architecture in 1926, and after completing his thesis requirement from Dunedin undertook further study in London, before returning to Dunedin to join his father’s practice in 1933. He was quick to employ modernist methods and style, notably in a private house for T.K. Sidey in Tolcarne Avenue. 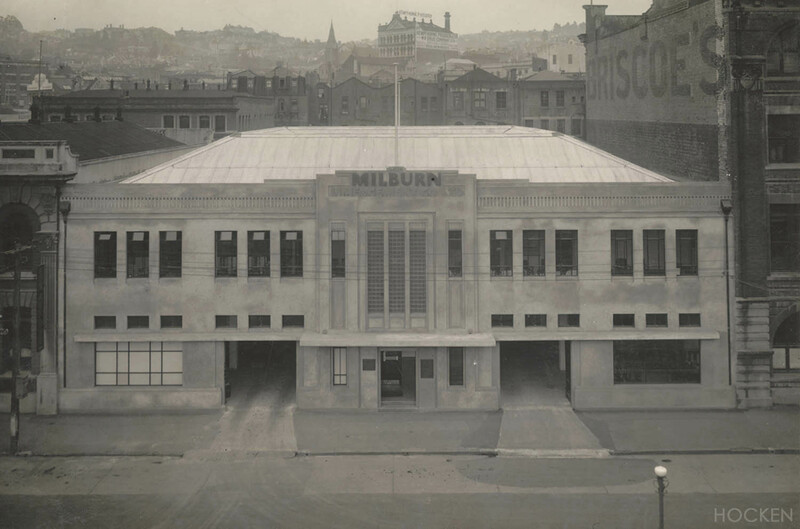 His design for the Milburn building a few years later sits in striking contrast with the adjoining warehouse on the Police Street corner, designed by his father thirty years before. 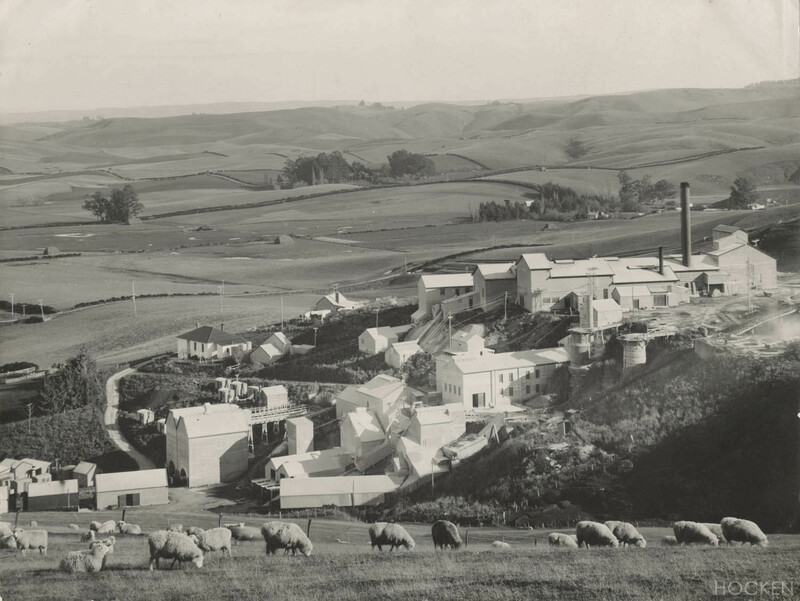 The Plunket Society’s Truby King Harris Hospital at Andersons Bay (1938) is a particularly good example of his work around this time, and for further reading I highly recommend report on that building prepared by Michael Findlay and Heather Bauchop for Heritage New Zealand. Tenders for the construction of the Milburn building closed in April 1937, but the lowest received (£14,990) was considered too high, so plans were modified and in June W.H. Naylor Ltd were contracted to build more modest premises at a cost of £10,635. A separate central heating contract of £735 was fulfilled by George W. Davies & Co., and the building was ready for occupation by July 1938. There was warehouse storage on the ground floor with dual vehicle entrances to both Crawford and Bond streets, allowing large vehicles to drive right through. Administrative offices were on the first floor, where a further three suites of offices were let out. In many ways the building was conventional – essentially a box with hipped roofs behind its parapets – but the Moderne facades were strikingly different from almost anything else in the city at the time, even if the nature of the site gave little scope for some of the streamlining effects and variations of form associated with this style. Unusual features were glass bricks, which let filtered light into the stairwell facing Crawford Street, as well as adding visual interest to the exterior. The building was one of the first in New Zealand to use them. The Evening Star reported that they had previously been used in one private residence in Dunedin, and that they were also to be incorporated in the rebuilding of the Dunedin Savings Bank in Dowling Street (another Salmond & Salmond project). This slightly predated the first major use in Auckland: extensive additions to the Chief Post Office made in 1938. Glass blocks were used in the nineteenth century, but their practicality as a building material was advanced markedly by Friedrich Keppler, who in 1907 patented a system for building walls of prismatic bricks within reinforced concrete frameworks. The architects Walter Gropius and Le Cobusier were among the early adopters of glass bricks, and they were famously used in the latter’s Maison de Verre of 1928-1932. Mass-manufacture only occurred after the Owen-Illinois Glass Company of Chicago introduced the first pressed-glass blocks in 1932, and promoted them at the Chicago World’s Fair of 1933. In 1935 the company brought out Insulux, the first widely-used hollow glass brick, and other American manufacturers soon followed with similar products. A building reported as ‘Australia’s first glass brick building’ was erected for Thomas H. Webb & Co. in Adelaide in 1935 using imported bricks. 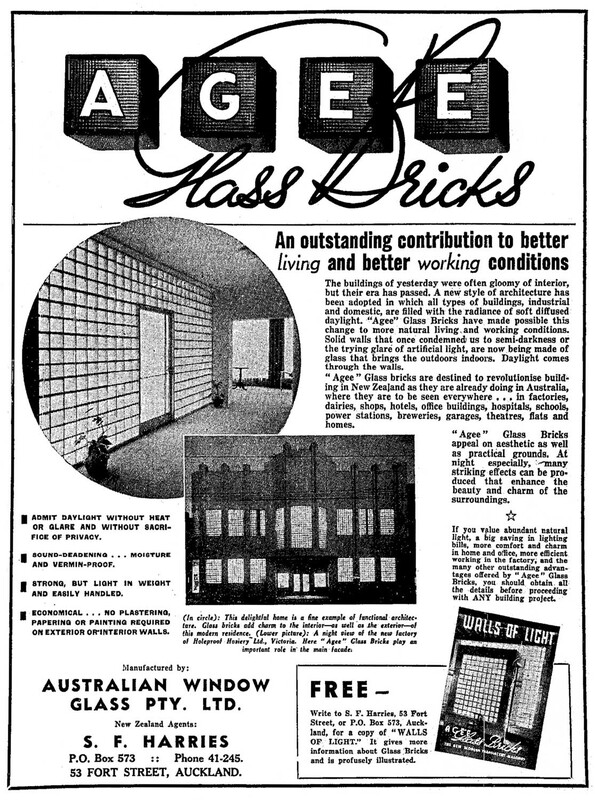 From 1936 Insulux bricks were produced in Australia under the Agee brand by the Australian Window Glass Pty Ltd, and they found extensive use almost immediately. 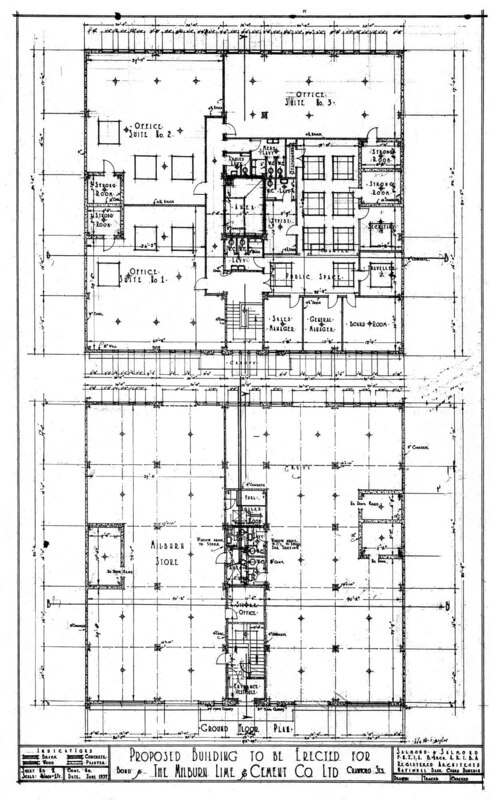 They were used to prominent effect in Alkira House in Melbourne, and by the end of 1936 were being incorporated into the design of residential, commercial, industrial, and institutional buildings. The Milburn building used the Agee bricks, which were imported through local agents Paterson & Barr. 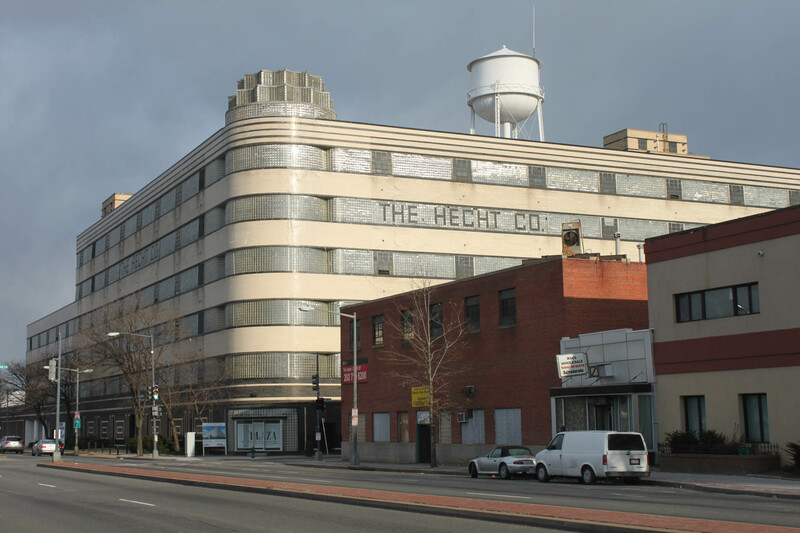 The Hecht Company’s Streamline Moderne warehouse in Washington DC was also built in 1937, when glass brick was at the height of its international fashion. Image courtesy of ‘Joseph’ on Flickr. The building was constructed on a floating foundation with a concrete base, due to the reclaimed nature of the land. The concrete structure above was reinforced with steel rods, and the bluestone aggregate given a Snowcrete white cement finish, tinted to a cream colour. On the Crawford Street elevation the company name was set back into the plaster and flanked by a simple ornamental frieze, with additional touches of colour (red or green) used sparingly to suit the unfussy design. 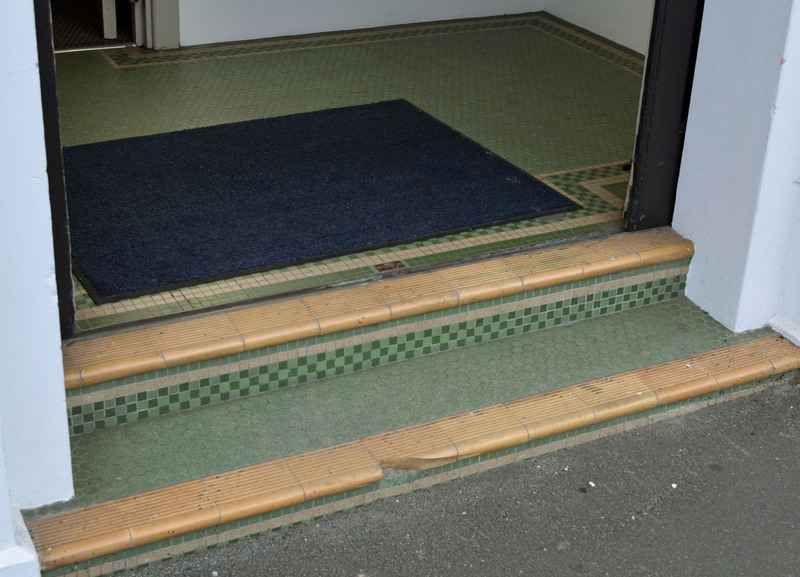 Mosaic and other tiles to the foyer were green and gold in colour, complementing the finish of the masonry. A simpler facade for Bond Street featured the company name prominently in relief lettering, and as on the other elevation the windows were steel framed with slender profiles. Skylights were installed in the roof, which was covered with Fibrolite corrugated asbestos sheets. The interior was simply fitted out, with rimu skirtings and internal doors, and a main reception counter of Oregon with a kauri top. 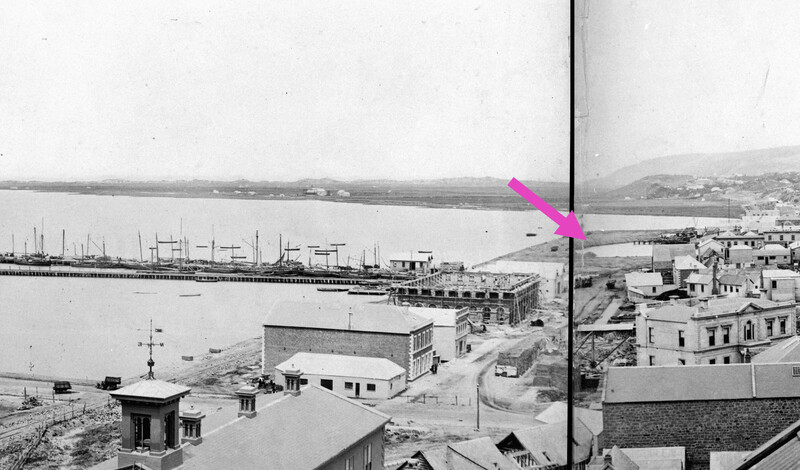 Early tenants in the building included Donaghy’s Rope & Twine Co., Otago Fruit & Produce, the Ewing Phosphate Co. (owned by Milburn), and the Otago-Southland Manufacturers’ Association. 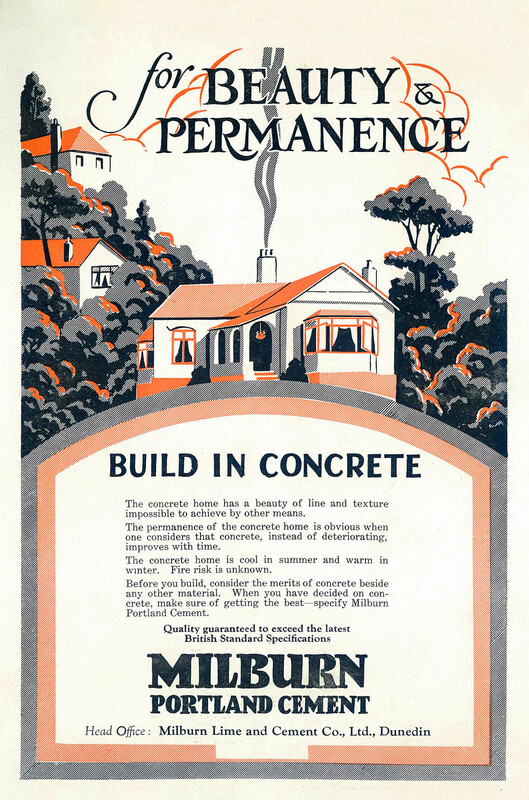 In 1963 Milburn merged with the New Zealand Cement Company to form New Zealand Cement Holdings Ltd. The head office remained in Dunedin until 1974, when it moved to Christchurch and the company vacated the Crawford Street building. New Zealand Cement Holdings became Milburn New Zealand in 1988 and now trades as Holcim New Zealand Limited (a division of a company headquartered in Switzerland). 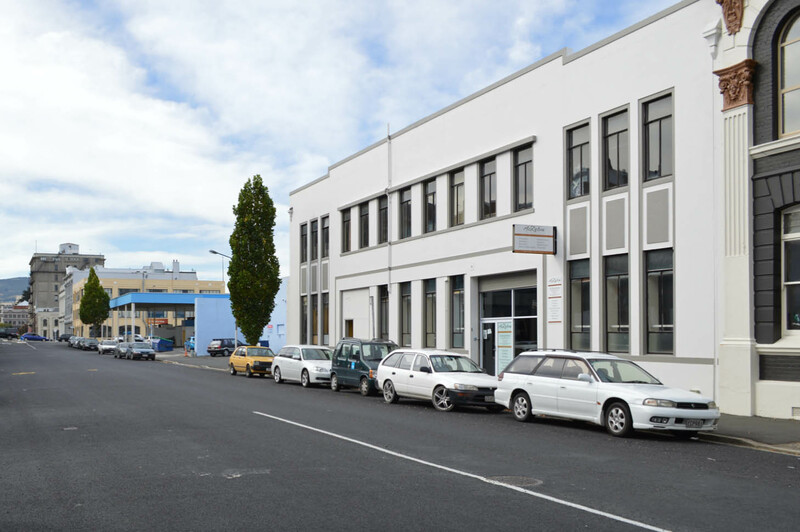 In 1974 the building became the office of the large textile firm Mosgiel Limited, which remained until the company collapsed in 1980. The old vehicle entrances have now long been closed and those on Crawford Street converted to shop fronts. The one to the south had been enlarged in 1965, giving the east elevation a slightly lopsided look. 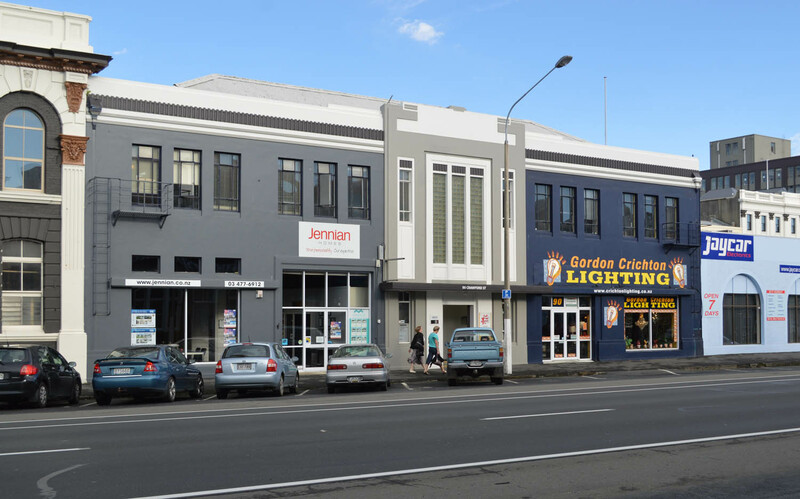 The original exterior finishes have been painted over a number of times over the years and the last repainting (a project supported by the Central City Heritage Re-use Grants Scheme) happily reduced the impact of signage and decluttered the Crawford Street facade. The building looks well cared for, and has been kept productive. A still simpler colour scheme to Crawford Street would restore some of the horizontal emphasis and clean simplicity of the original design. The building remains evocative of the the style and spirit of its age, and in a way it stands as a monument of concrete, to concrete. This post has some of my favourite images used on the blog so far – found trawling the uncatalogued depths of the massive collection of Milburn records held by the Hocken. I hope you enjoy them. I especially love the shot of the crisp new building with the smoky urban skyline behind! Patterson, Elizabeth A. and Neal A. Vogel. ‘The Architecture of Glass Block’ in Old House Journal. Vol xxix no.1 (Jan-Feb 2001) pp.36-51. This entry was posted in Buildings and tagged 1930s, Arthur Louis Salmond, Bond Street, Briscoe & Co., concrete, Crawford Street, glass bricks, James Louis Salmond, Milburn, Milburn Lime & Cement, Moderne, Salmond & Salmond, W.H. Naylor Ltd, Warehouse Precinct on 27 March 2015 by David Murray. Fantastic research! Enjoyed this story very much. Thanks once again for your wonderful research. The progress in the two shots of Crawford st, less than ten years apart, is simply mind boggling, compared to today’s glacial like change…take note current city council. Keep up the very good work David. Thanks Ross. 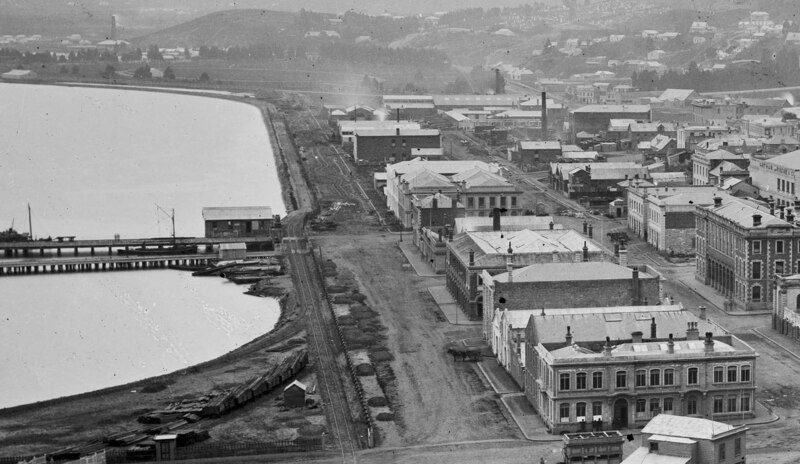 It’s quite staggering how quickly Dunedin developed in the 1860s and 1870s. I wasn’t aware Agee made glass bricks, but of course they did. I hadn’t been aware of it either until I researched the post but yes, it makes total sense for them to have met the demand in Australia and New Zealand. I read that an American factory (presumably Owen Illinois) went from the manufacture of 600,000 glass bricks over the entire year 1935, to over one million per month in 1936. I like the illustration of an entire wall made out of them with a door set in it. That would be quite stunning. However I can’t recall seeing a great deal of use of them in real life. I remember in Sydney there was a very large modernist style building with glass bricks on curved corners in the Waterloo area. I think it was an old brewery building, perhaps Carlton. I believe it still stands and is part of an apartment complex now. Here they seem to have been most popular in industrial buildings and stairwells, from the late 1930s to the mid 1950s. Also, hotels would use them in bars, which weren’t allowed to be seen from the street but benefited from some natural light. Wouldn’t restoration of the original Crawford St frontage of the entire building be wonderful! Yes! The current owners have hugely improved the appearance of the building (compare with the 2012 Google street view at https://goo.gl/maps/1ORyV) but if the former vehicle entrance on the southern side (enlarged 1965) was restored to match the one on the northern side it would make the world of difference. Opinions always vary on colour … subtly warm creams aren’t much in fashion at the moment but they are period colours I have a personal liking for. A cream is used simply on the old John Edmond building in Bond Street and suit it well. Original period lettering survives there, and had been a delightful feature of the Milburn building (the Bond Street facade looks a bit blank without it, to me).